Revo adds a touch of colour to connected radio with AXiS iPod system | What Hi-Fi? 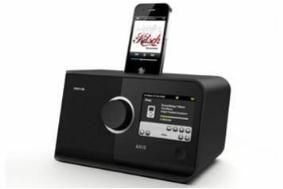 Not only does AXiS offer a dock for both iPods and iPhones, complete with built-in amplifier and speaker, it also has DAB/DAB+/FM radio reception, and thanks to built-in wi-fi can access internet radio, streaming services such as Last.fm and music stored on network computers and drivers. It's powered by Frontier Silicon's new multi-standard Venice 8 receiver module, and controlling all this functionally is a 3.5-in colour TFT touchscreen display with an icon-driven interface for easy navigation. AXiS is compatible with all generations of iPod and iPhone, with video out connecteors to feed a TV, and also has stereo RCA and 3.5mm aux-in sockets, and a headphone output. It will be available for £199.95 from October 1 from Apple Stores, Comet, Harrods, John Lewis, Next Directory and Selfridges, and comes complete with a free 30-day LAST.fm trial subscription. Alternatively, AXiS can be preordered from Revo's own online shop, Advanced MP3 Players, Firebox, Hughes Direct, Peter Tyson and Superfi.